All my life I have wondered what those first little spring peepers look like, and finally the other day, after much searching and crawling through my flowerbed, I pinpointed the little ventriloquistic critter! I slowly crept closer, turning my camera on as I neared the little frog. I steadied the camera at just the right angle and began to press the button to take a picture, when I saw the dreaded words calmly appear on the LCD screen… NO MEMORY CARD!! I wanted to scream, but instead I hastily, but quietly backed away, scurried in the house, breathing a little prayer that my little subject would stay put, and retrieved the card. Thankfully, it hadn’t moved an inch when I returned with the camera AND the card! You can tell how tiny it is by the size of the pea gravel it is sitting on. What a small creature with such a strong voice! Hubby came home from work one day, all excited about a pile of old barn wood he discovered alongside the road. When he asked for permission to sort through, they said no problem, the more we take the less they need to burn! Imagine that! I spotted the above treasure as soon as I laid eyes on the pile. 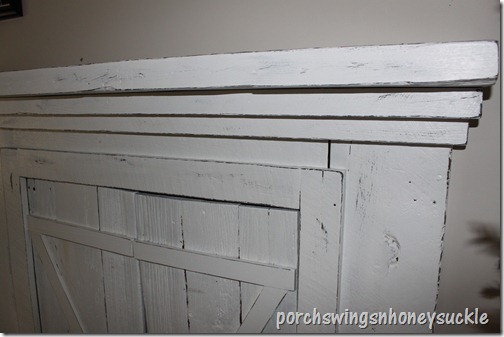 Hubby was ready to tear off the boards from the door frame and I said no way! So we lugged the heavy, wobbly piece over to the trailer (it was all I could handle, but I had an inspiration to egg me on!) This beauty is 7’x7’! BUT…given the size, we would need to take out walls to get it into the bedroom! And I’m not ready to take the saw to it just yet. SO.. I have another plan for it that I will share with you later on this spring or summer. ACTUALLY, I just now thought it will take a whole other blogpost to write about this.. SO I will wait a few days to share! Trust me, I think it will be worth it!